We have elaborated the hypothesis on the basis of various interrelated mechanisms between T2DM and periodontitis that are likely to magnify adding to the pathology underlying the neurodegenerative disease [Figure 1]. Potential periodontal pathogens may directly cross the blood brain barrier and produce neurodegenerative changes. Amplified systemic inflammation, immune responses, and associated brain cytokine pool secondary to these periodontal pathogens leading to the overactivation of microglial cells consequently leading to neurodegeneration. Facts of Dementia. World Health Organization. Available from: http://www.who.int/features/factfiles/dementia/en/. [Last accessed on 2017 Nov 8]. Kodl CT, Seaquist ER. 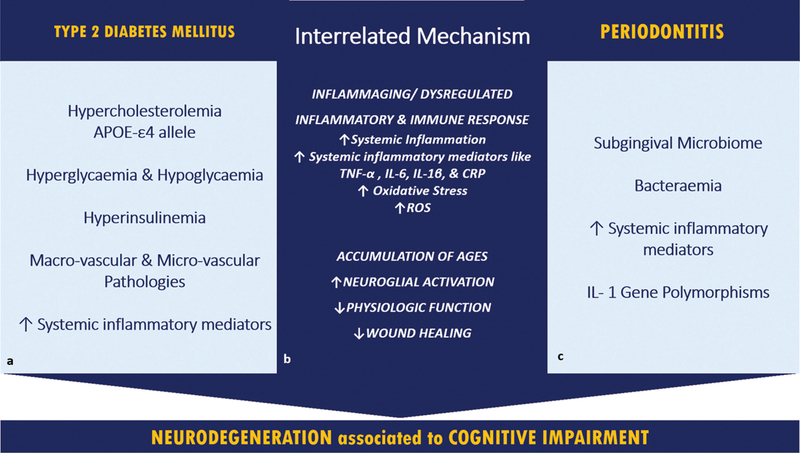 Cognitive dysfunction and diabetes mellitus. Endocr Rev 2008; 29: 494-511. doi: 10.1210/er.2007-0034. Manschot SM, Brands AM, van der Grond J, Kessels RP, Algra A, Kappelle LJ et al. Brain magnetic resonance imaging correlates of impaired cognition in patients with type 2 diabetes. Diabetes 2006;55:1106-13. Streit WJ. Microglial senescence: Does the brain’s immune system have an expiration date? Trends Neurosci 2006;29:506-10. Franceschi C, Valensin S, Lescai F, Olivieri F, Licastro F, Grimaldi LM et al. Neuroinflammation and the genetics of Alzheimer’s disease: The search for a pro-inflammatory phenotype. Aging (Milano) 2001;13:163-70. Takeda M, Ojima M, Yoshioka H, Inaba H, Kogo M, Shizukuishi S et al. Relationship of serum advanced glycation end products with deterioration of periodontitis in type 2 diabetes patients. J Periodontol 2006;77:15-20. Stein PS, Stephen, Dawson DR III. Alzheimer’s Disease and Periodontal Disease: Mechanisms Underlying a Potential Bidirectional Relationship. Available from: http://www.dentistryiq.com/articles/gr/print/volume-1/issue-3/original-article/alzheimerrsquos-disease-and-periodontal-diseasemechanisms-underlying-a-potential-bi-directional-relationship.html. [Last accessed on 2017 Nov 8]. Yuan K, Chang CJ, Hsu PC, Sun HS, Tseng CC, Wang JR. Detection of putative periodontal pathogens in non-insulin-dependent diabetes mellitus and non-diabetes mellitus by polymerase chain reaction. J Periodontal Res 2001;36:18-24. Noble JM, Borrell LN, Papapanou PN, Elkind MS, Scarmeas N, Wright CB. Periodontitis is associated with cognitive impairment among older adults: Analysis of NHANES-III. J Neurol Neurosurg Psychiatry 2009;80:1206-11. McArthur WP. Effect of aging on immunocompetent and inflammatory cells. Periodontol 2000 1998;16:53-79. Schmidt AM, Weidman E, Lalla E, Yan SD, Hori O, Cao R et al. Advanced glycation endproducts (AGEs) induce oxidant stress in the gingiva: A potential mechanism underlying accelerated periodontal disease associated with diabetes. J Periodontal Res 1996;31:508-15. Graves DT, Liu R, Alikhani M, Al-Mashat H, Trackman PC. Diabetes-enhanced inflammation and apoptosis − Impact on periodontal pathology. J Dental Res 2006;85:15-21. Linden GJ, Lyons A, Scannapieco FA. Periodontal systemic associations: Review of the evidence. J Periodontol 2013;84(4 Suppl): S8-19.